Something to look forward to: In August last year, Samsung unveiled its first dual rear camera smartphone, the Note 8. Just over 12 months later, the company has joined Huawei by creating its first handset with a triple camera setup: the 2018 version of the Galaxy A7. The Galaxy A7 boasts a triple-lens setup that features a 24MP primary camera with a F/1.7 aperture, an 8-megapixel shooter with a 120-degree ultra-wide field of view, and a 5MP “depth” module used for bokeh effects. There’s also a 24MP front-facing cam with an LED flash and "Selfie Focus" effect for adding bokeh. But being a mid-range device, there’s a noticeable absence of a telephoto lens. One high-end feature the A7 does have is Intelligent Scene Optimizer, which debuted on the Galaxy S9. This automatically recognizes what you’re pointing the camera at and adjusts the camera settings to produce the best image quality. The A7’s non-camera specs include a 6-inch 1,080 x 2,220 Super AMOLED screen, an 8-core 2.2 GHz processor (likely to be an Exynos 7885), 6GB of RAM, 128GB storage that’s expandable to 512GB, NFC for Samsung Pay, and a 3300mAh battery. There’s even a fingerprint sensor on the side, Dolby Atmos support, and Bixby—though there’s no dedicated button for the AI, which some may see as a plus point. All in all, some pretty impressive specs for a mid-range handset. 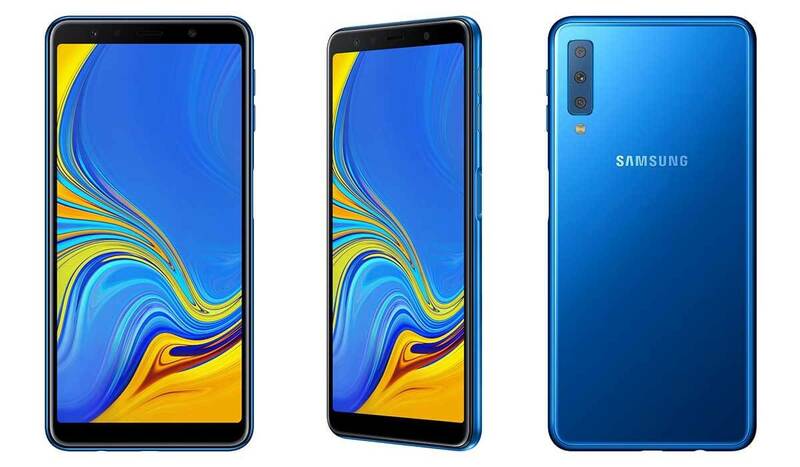 The new Galaxy A7 will be available in blue, black, gold and pink in select European and Asian markets from this fall. It will reach other locations at a later date. No word yet on price, but we’ll learn more about the phone, and Samsung’s first quad-camera device, at the Galaxy Event on October 11.